Over the winter, I’ve enjoyed making homemade ice-cream and now that the weather is warming up, I thought I’d try making a refreshing sorbet. In a saucepan, bring 1 cup sugar and 1 cup water to a boil. Reduce to a simmer and stir until the sugar is dissolved. Remove from heat. Roll the rosemary leaves between your fingers or tap them firmly with the back of a spoon to slightly break the skin of the leaves and release the oils. Add to water and sugar mixture along with the 2 peels from the lemon. Let cool to room temperature. 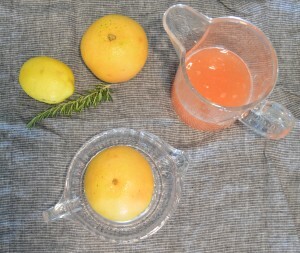 Juice about 4 grapefruits to provide 3 cups of grapefruit juice. Add the juice of 1 lemon. Be sure to remove any seeds, but a little pulp can remain. 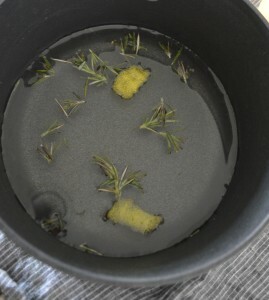 Once the sugar and water mixture has cooled, drain out the rosemary leaves and lemon peel. Add to the grapefruit juice. Pour the sorbet mixture into an electric ice cream maker and mix for 20-30 minutes until it reaches desired consistency. Eat immediately or store in the freezer in a closed container.